Sign in to Wolf Den. Use the login and password given at the top of the page as necessary. Why do I need to cite my sources? What is plagiarism and is it serious? Plagiarism is a form of cheating in which you use another's words or ideas as if they were your own. Plagiarism can result in failure of an assignment or even failure of a course. Repeated plagiarism may result in expulsion. How do I avoid plagiarizing? Whenever you use an author's exact language in your paper, make certain to use quotation marks to indicate what words are the author's and then cite the quotation. When you change the author's words to your paraphrase the author's ideas, make certain you cite. 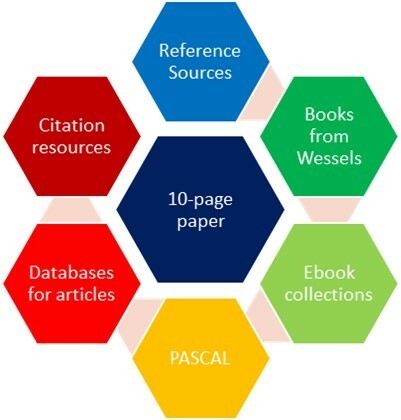 Use reference sources to gain an overview of a topic. This step can help you identify aspects you want to focus on in further research. Browse the reference section of Wessels Library, particularly with call numbers in the PN and Z sections. Search the catalog with broad subject terms. On the far left, click on the word Reference. Search for plays by title; author; subject (sisters, culture conflict, marriage); style (symbolism, experimental theater); genre (comedy, melodrama, musical); cast type. Provided by PASCAL. Coverage extends as far back as 1975. Covers academic disciplines such as language, literature, folklore, linguistics, literary theory and criticism, and the dramatic arts. Covers fine, decorative and commercial art, folk art, photography,film and architecture. During reference hours, a librarian is available to assist with research. Find Books at Wessels. Narrow results by selecting the Item Type labeled Books.